Question: It’s another beautiful day in South Africa’s Kruger National Park and you’re hanging out with a herd of your family and best friends. 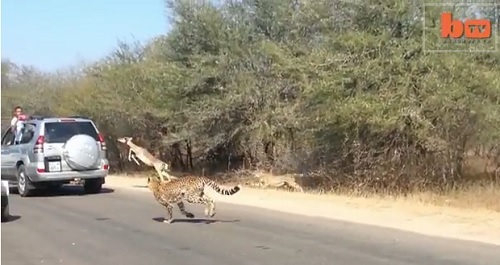 Suddenly you’re about to become lunch for two hungry cheetahs. What do you do? Answer: Take the first window of opportunity of course! This video is simply amazing and it's the coolest visual example I’ve ever seen for explaining the expression, “window of opportunity." Click below to see the video and learn more about this English expression. Just when it seems the impala is cornered by the cheetahs, he manages to escape by jumping into a car through an open window. This was an unexpected window of opportunity and it saved his life. window of opportunity definition: an opportunity to do something that is only available for a short period of time. It’s something that you need to do quickly and seize the moment before the chance passes by. Although the cheetah entered through the car window he quietly exited through the door. Can you imagine how surprised the passengers must have been to get a hitchhiker in the middle of their safari tour? The Director of the Bank will be speaking on the first panel so there's a window of opportunity to speak with him if you wait by the elevator and can ride down with him. Is there a window of opportunity to paint the apartment before the next tenants move in? The flight was overbooked so there was a window of opportunity to take a later flight and get a $500 voucher for future travel but by the time I got to the counter three people had already volunteered. If you really want to be a model, take any window of opportunity that arises. They needed a temporary receptionist and it was a window of opportunity for me to showcase my skills and they invited me to interview for another position. The ceasefire provided a window of opportunity for a peace agreement between the government and rebels. The stock prices are low so you should invest in the company now while there's a window of opportunity. Since we had twins we've learned to take any window of opportunity to take a nap or rest. Your turn to use the idiom "window of opportunity"
Now it’s your turn. Practice makes progress. Write your own example sentence of the idiom "window of opportunity" in the comments below.